GRANDVIEW, Wash. – For the first time since 1952, Otis Harlan will be out of the wine business. The owner of Otis Vineyard in the Yakima Valley north of Grandview has sold his land to another longtime winemaking and grape-growing family that plans to re-launch a family business that started in 1946 in Southern California. Harlan, who lives in Yakima and is now in his mid-80s, purchased what became Otis Vineyard in 1954. Two years later, he planted a block of Cabernet Sauvignon that is still producing wine grapes today. 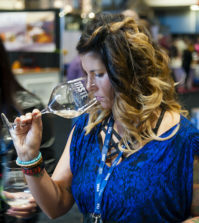 Those people included William B. Bridgman, who helped launch the Washington wine industry in 1917, and David Lake, the talented winemaker for Associated Vintners/Columbia Winery. 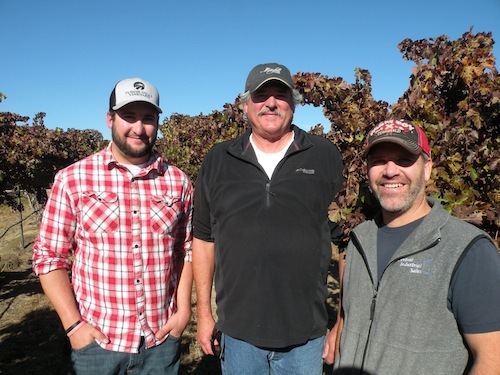 The father-son team of Tom and Sean Tudor and Sean’s uncle Mark Tudor purchased the historic vineyard along County Line Road, just up the hill from their family’s longtime vineyards. Tom’s father, Andy, founded Tudor Hills Vineyard in 1947 in Fontana, Calif., in the Cucamonga Valley east of Los Angeles near San Bernardino. By the early 1960s, the Tudor family had started a winery with a capacity of 3 million gallons. 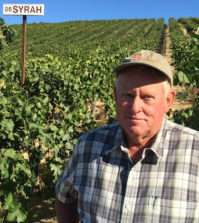 Rising land prices forced the family to sell the land in the late 1960s, and the Tudors relocated to the Yakima Valley, where Andy Tudor planted 160 acres of Concord grapes and worked for Seneca Foods. He was the winemaker for Seneca’s Boordy Vineyards until his death in 1976. 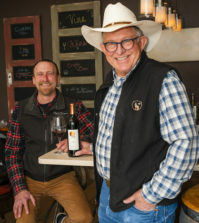 Tom Tudor began planting wine grapes in the 1980s in the Yakima Valley, and he and Sean added vines to property they owned adjacent to Otis Vineyard. At the beginning of this year, Harlan approached the Tudors about purchasing his vineyard. The deal was finalized last month, and the Tudors will take over the property in December. 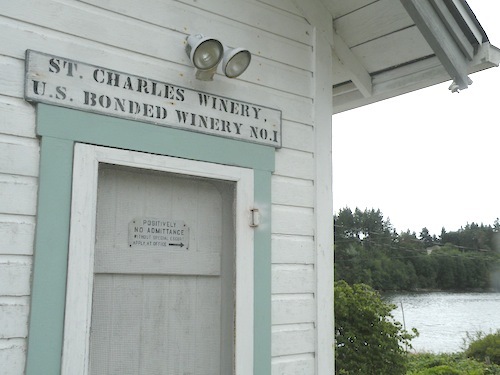 Harlan got into the wine business after purchasing St. Charles Winery, which was Washington state’s first bonded winery after Prohibition. St. Charles launched in 1933 in the Puget Sound town of Grapeview, which is not far from the Hood Canal community of Belfair. The St. Charles building – which Harlan did not purchase – remains today on Stretch Island. Harlan called his newly acquired winery Alhambra and moved to Yakima in 1952, locating the winery in nearby Selah. 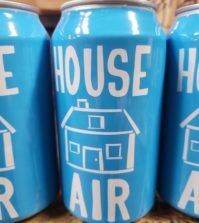 Needing a steady source of grapes, he bought a vineyard north of Grandview from a man named Ralph Adams. 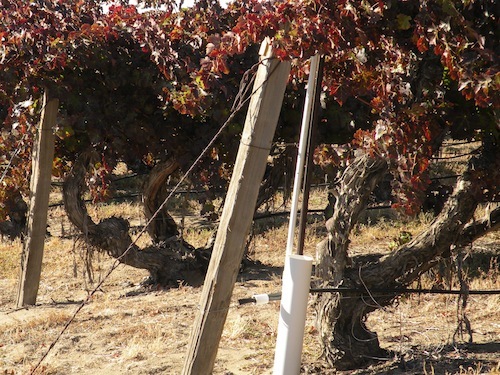 It was planted mostly to North American and hybrid varieties such as Concord, Campbell’s Early and White Diamond, though it also had a few vinifera vines, including Zinfandel. “They were a lot of trouble,” Harlan said of the Zinfandel, adding they were susceptible to bunch rot, so he tore them out after a few years. He slowly replanted the entire vineyard, with the 1956 Cabernet Sauvignon vines now the oldest on the property – and believed to be the oldest commercial Cab vines in Washington. Today, Otis has old plantings of Chardonnay, Sauvignon Blanc and Pinot Gris. However, he doesn’t have any Riesling, a peculiarity in the Riesling-heavy Yakima Valley. Early in his grape-growing career, Harlan met Bridgman, who began planting wine grapes in 1917 and launched his Upland Winery in nearby Sunnyside in 1934 — the year after St. Charles was founded. In 1979, Harlan met a young winemaker named David Lake, who had just landed in Washington as winemaker for Associated Vintners – later to be renamed Columbia Winery. Lake was enamored with Otis Vineyard and made celebrated vineyard-designated Cabs and Chardonnays from Otis beginning with the 1981 vintage. Lake died in 2009, and Columbia Winery is now owned by Gallo, which still purchases a lot of the grapes from Otis Vineyard. Harlan said he’s finally ready to retire completely from the grape business and focus his energy elsewhere. The younger Tudor is teaming up with Robert Smasne, one of the most prolific winemakers in the Yakima Valley, whose winemaking facility is just a few miles from Otis Vineyard. Together, they will be producing 200 cases of wine under the Tudor Hills Winery label from the 2013 vintage. A Sangiovese rosé and Chardonnay will be released next spring, and a Syrah, Malbec, Cabernet Franc and Cabernet Sauvignon will follow. The Cabernet Sauvignon will come from the 1956 vines at Otis. Tudor plans to release it in 2016 to mark the 60th anniversary of their plantings. Smasne is especially excited to work with these old vines. He grew up next door, where his parents grew Concord grapes. As a child, Smasne and his brothers would sneak into Otis Vineyard and taste the grapes. Even as a 10-year-old, Smasne noticed something different about the grapes Harlan grew, and a winemaking spark flickered in his young mind. Yet even though he grew up in the shadow of Otis Vineyard, and the fruit here inspired his remarkable winemaking career, he’s never made wine from Otis Vineyard grapes. Until now. Before launching Smasne Cellars, Smasne worked at Covey Run, a winery then owned by the same company that controlled Columbia Winery. As a result, Smasne worked with Lake and recalls the Otis Vineyard connection. Enjoyed the article about Otis vineyard very much. I had the pleasure of meeting David Lake some years ago. Do you have any plans to write about another old vineyard, Harrison Hill? My wife and I have a special connection with HH as we were both students of one of the original founders of Associated Vinters V. S. Mallory, who we understand located the spot for the vineyard based on his expertise on the soils and exposure of the area. We enjoy the fruits of his labor with the Delille HH vintages. Thanks for the kind words. David Lake was a one-of-a-kind man, and the Washington wine industry is better because of him. We have written a little bit about Harrison Hill, but you are correct that there is a larger story to tell there, beginning with William Bridgman on through to the Newhouse family. We will put HH on our to-do list!